Nursing alumna Cheryl Seavey Murphy (right) provided advice and financial support to help Margaret Ann Hoffman become a labor and delivery nurse. 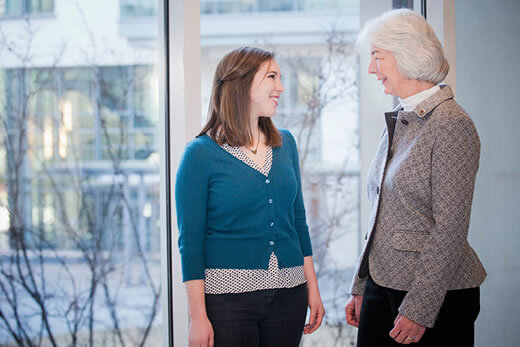 The university's Adopt-a-Scholar Program provides a way for alumni to honor their time at Emory. Within the Nell Hodgson Woodruff School of Nursing, alumni provide a minimum gift of $2,500 annually for two years to support a qualifying student. Donors meet and communicate regularly with their nursing scholar. To learn how to become part of the program, contact Amy Dorrill, associate dean and chief development officer, at 404-727-6264 or amy.dorrill@emory.edu. For Adopt-a-Scholar opportunities throughout the university, contact the Office of Annual Giving.